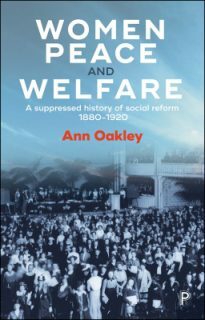 Ann Oakley will be speaking about Women, Peace and Welfare at the Bristol Festival of Ideas. Leading sociologist Ann Oakley undertook extensive research to uncover a previously hidden cast of forgotten characters. She uses these women’s stories to bring together the histories of social reform, social science, welfare and pacifism. And she reveals how their efforts, connected through thriving transnational networks, lie behind many features of modern welfare states and reminds us of their powerful vision of a more humane way of living – a vision that remains relevant today. Ann Oakley is professor of Sociology and Social Policy at the UCL Institute of Education. A social researcher for more than 50 years, and author of many academic publications, she is also well known for her biography, autobiography and fiction. Her books include The Sociology of Housework; From Here to Maternity; and The Men’s Room which was serialised by the BBC in 1991. Her latest book is Women, Peace and Welfare: A Suppressed History of Social Reform, 1880-1920. She will be speaking about ‘Women, Peace and Welfare’ on 17 April at the Bristol Festival of Ideas. Established in 2005, the Bristol Festival of Ideas emerged out of Bristol’s bid to be Capital of Culture in 2008. The idea behind it was to bring more debate in the city and to celebrate the work of great writers, commentators and thinkers in and outside the city. It is an initiative of Bristol Cultural Development Partnership (BCDP): Bristol City Council, BusinessWest, University of Bristol, University of the West of England. This year the fourth ‘Coleridge Lecture’ series marks the 100th anniversary of the act which extended the right to vote in the UK with speakers exploring injustice, identity, inequality and a more humane way of living. The speakers so far this year were Shami Chakrabarti, on 3 April, and June Sarpong, on 10 April. Ann Oakley speaks on 17 April; Afua Hirsch on 24 April; Laura Bates on 1 May; Diane Coyle on 8 May; and Helen Pankhurst on 10 May.